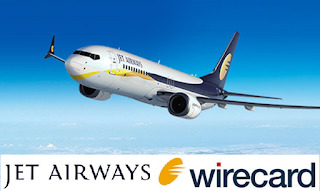 One of the largest private Indian airlines, Jet Airways (India) Limited, has expanded its collaboration with Wirecard, the leading innovation driver in digital financial technology, in order to offer a wider range of international payment solutions. The companies have been collaborating for ten years - the current expansion includes more payment options worldwide. Established in 1992, Jet Airways carries millions of passengers today and has 66 destination airports in Asia, Europe, and North America. In parallel, India is among the world's fastest-growing markets for airlines travels: At the beginning of the new millennium, around 14 million people in India boarded an aircraft every year - meanwhile, it is almost 140 million. To process payment at local travel agencies around the world, Jet Airways uses the International Air Transport Association (IATA) interface for billing together with settlement plan (BSP) via Wirecard's platform. This allows Jet Airways to process ticket sales in a faster and easier way, as this is the most widespread system in the world for simple processing of airline ticket sales. In order to offer holidaymakers and business travelers additional convenience and greater choice during the payment process for their booking, Jet Airways is implementing Wirecard's technology solutions straight away via all channels.